Srila Prabhupada arrived in Sri Vrindavan Dhama on May 17th 1977 to prepare to 'leave his body.' He made all of the arrangements for the future of his movement. He formed his Will, the Temple Property Trusts, he gave instructions for the Bhaktivedanta Book Trust and the GBC and he established his initiation system for the future of ISKCON. Due to some unseen good fortune I got the opportunity to serve Srila Prabhupada, at that time. Actually, I began to personally serve him in Bombay as one of his guards and then went with him to Hrsikesh to 'regain his failing health' on the advice of one of the life members, Mahadevia Kartikeya. I used to enjoy taking Japa Walks in the Himalayan Mountains. The forests are lush, filled with singing birds, and wandering devotees. Some Shivite's live in the cave's and only leave to bath in the Ganga. They eat only what is offered to them. I used to also enjoy taking walks up along the Ganges Bank and then jump in the rushing Holy River and ride a log back to Srila Prabhupada's house chanting all the way. This reminded me of when Visnujana Swami was pulled by a rope in the water by the boat in Bengal as he chanted the Holy names of the Lord ~ Om Namo Bhagavate Vasudevia.etc. We used to Perform Hari Nama Sankirtan in the Market Place just down from our house on the Ganga. We would chant until about 5pm then take the kirtan back to the rooftop of our house. Then at about 5:30pm Srila Prabhupada would give his darshan to the general public. Although we did not advertise the darshan; the room was always full of interested guests every night. Srila Prabhupada preached to them in his unique and charming way. He used his great Vaisnava wit to charm the crowds and inspire them to take to Krishna Consciousness. Most everyone left convinced, a few maybe not, but everyone who saw Srila Prabhupada felt that he was a perfect gentleman and a great and loving host. He always paid attention to everyone and made sure all guests received Prasadam. Srila Prabhupada also taught us each how to cook a basic meal of rice, dahl, and chapatis. The mercy of Srila Prabhupada was flowing like the Ganges at this time. And actually, it still is! Yes, things were ecstatic in Hrisikesh, until that night when Srila Prabhupada first told us that he was going to leave his body. "Tomorrow we will go to Vrindavan; better to die in Vrindavan." We were shocked! We knew Srila Prabhupada was sick but didn't think it was that serious; we thought he would recover. Pradyumna Prabhu and I were sent ahead to Vrindavan to make arrangements for Srila Prabhupada's arrival. Pradyumna and I arrived in Vrindavan from Hrishikesh at about 4am. We alerted the temple President, Akshayananda Maharaja, of Srila Prabhupada's statement that he was coming to Vrindavan to 'leave his body'. The Maharaja didn't tell the devotees right away why he was coming, just that he was coming soon and he asked the devotees to clean Srila Prabhupada's quarters. The Holy dust of Vrindavan had blown about everywhere and there was a lot of mercy to deal with. Srila Prabhupada arrived at the temple at about 7am. At this point Srila Prabhupada's health had deteriorated so much that he could no longer walk on his own. The devotees in Vrindavan, and around the world, were unaware of this. We brought a rocking chair out to the car to carry Srila Prabhupada. He asked, as usual, to see the Deities first. We carried him into the temple and placed him before Sri Sri Gaura-Nitai. Srila Prabhupada stood up offering his respectful obeisance's to Their Lordships. At that point someone took the chair away. Srila Prabhupada stood there gazing at Sri Sri Goura-Nitai for a few moments as tears gliding down his face. Then he moved to sit in the chair that wasn't there and we had to catch him. The devotees looked at each other with surprise. We brought the chair back and carried Srila Prabhupada over to Sri Sri Krishna and Balarama. Again Srila Prabhupada stood up with tears in his eyes as he gazed at Their Lordships for quite some time. We then moved over to Sri Sri Radha Symasundara and Sri Lalita and Sri Visaka's alter. Again Srila Prabhupada rose up and gazed lovingly at the Deities. After a few moments he turned to us and said that he wanted to see all of the devotees in his room. "So I cannot speak. I am feeling weak. I was to go to other places like Chandigarh, but I canceled the program because the condition of my health is very deteriorating. So I preferred to come to Vrindavan. If death takes place, let it take here. So there is nothing new to be said. Whatever I have to speak, I have spoken in my books. Now you try to understand it and continue your endeavor. Whether I am present or not present, it doesn't matter. As Krsna is living eternally, similarly, the living being also lives eternally. But kirtiryasya sa jivah: 'One who has done service for the Lord lives forever.' So you have been taught to serve Krsna, and with Krsna we'll live eternally. Our life is eternal. Na hanyate hanyamane sarire. A temporary disappearance of this body, it doesn't matter. Body is meant for disappearance. Tatha dehantara-praptih. So live forever by serving Krsna. Thank you very much." At this point most of the devotees were crying. To me it still hadn't sunk in that Srila Prabhupada was about to leave us physically. Srila Prabhupada told us to discuss amongst ourselves and we talked about the future of ISKCON. Philosophically we understood that Srila Prabhupada would live with us in his books etc. but we would so miss his physical presence. The devotees began to wonder how the movement would go on without Srila Prabhupada to personally direct it. Srila Prabhupada: Just now everything is going on, but after my demise it may be taken away from your hand.I understood it long ago. It has been stayed, (?) Bombay, Vrindavan. So how are you going to guard yourself? That is the problem. Tamal K.G. : Your order that it be a trust property with lifetime trustees. Srila Prabhupada : So now you are all here. Very cautiously and everything agree. T.K.G . : That will protect it. At least the property will be protected. Srila Prabhupada : You should be very much determined, strong-minded. Otherwise it will slip. Such huge property. T.K.G . : Actually these properties are the envy of all of India. They're the best properties in each place. Srila Prabhupada : Not only property. Our prestige, our position. Everything is envied. Everywhere we are first class. T.K.G . : Yes, there is no rival. Bhavananda: There will be men, I know. There will be men who want to try to pose themselves as guru. T.K.G. : That was going on many years ago. Your Godbrothers were thinking like that. I finished putting Srila Prabhupada's translating materials on his desk and that was my service for the day. I retreated to my room in the guesthouse where I could see Srila Prabhupada translating all night long on his rooftop. It was amazing what Srila Prabhupada accomplished in just one day! On May 28th a committee of the GBC met in Srila Prabhupada's room and asked various questions for the future of ISKCON. "Our next question concerns initiations in the future, particularly at that time when you're no longer with us. We want to know how first and second initiations would be conducted." Srila Prabhupada answered: "Yes; I shall recommend some of you. After this is settled up, I shall recommend some of you to act as officiating acharyas." Tamal K.G. : "Is that called ritvik-acharya?" Srila Prabhupada replied: "Ritvik yes." Prabhupada : He's guru. He's guru. Satsvarupa : But he does it on your behalf. Prabhupada : Yes. That is formality. Because in my presence one should not become guru, so on my behalf, on my order... Amara ajnaya guru haia. Be actually guru, but by my order. Satsvarupa : So they may also be considered your disciples. Prabhupada : Yes, they are disciples. Why consider? Who? Tamala Krsna : No, he's asking that these ritvik-acaryas, they're officiating, giving diksa. Their... The people who they give diksa to, whose disciple are they? Prabhupada : They're his disciple. Tamala Krsna : They're his disciple. Prabhupada : Who is initiating. He is grand disciple. Tamala Krsna : That's clear. Prabhupada: When I order, "You become guru," he becomes regular guru. That's all. He becomes disciple of my disciple. That's it. This tape has been proven to have been doctored, but the fact remains that Srila Prabhupada says, "On my order" and "But by my order" and "When I order. 'You become guru'." The only order given so far was to be officiating or ritvik representatives of the acharya. This will be clarified in the next conversations and the July 9th 1977 Newsletter to all GBC's and temple presidents. Since the last part of this tape is so controversial we should remember that Srila Prabhupada never made changes by tape recording. Therefore the July 9th newsletter is the most important piece of evidence we have. This letter verifies what I heard and reported even before I ever heard the tapes or saw the letters after the 1990 San Deigo GBC guru debate. I mentioned the fact that Srila Prabhupada ordered ritvik acharyas to initiate after his departure to Yasodanandan Prabhu, who entered the information into his diary at that time. I'm using that diary to help compile this report. "What's this I heard from Gauridasa about [the] nomination of ritvik acharyas?" Bhavananda said, "It just means on behalf of Prabhupada. That's all. I can't wait until we start to do this." Srila Prabhupada said: "Tomorrow I will I will announce some ritvik acharyas who will initiate disciples on my behalf when I leave the planet." It was actually two days later on July 7th when Srila Prabhupada named the first eleven ritvik acharyas. Tamal K.G. : We're receiving a number of letters now, and these are people who want to get initiated. So up until now, since your becoming ill, we asked them to wait. Srila Prabhupada: The local senior sanyasis can do that. T.K.G. : That's what we were doing.I mean, formerly we were.the local GBC, sanyasis, were chanting on their beads, and they were writing to your Divine Grace, and you were giving a spiritual name. So should that process be resumed, or should we.? I mean one thing is that it's said that the spiritual master takes on the.you know, he takes on the.He has to cleanse the disciple by.So we don't want that you should have to.Your health is not so good, so that should not be.That's why we've been asking everyone to wait. I just want to know if we should continue to wait for some more time? Srila Prabhupada: No, the senior sanyasis. T.K.G . : So they should continue to. Srila Prabhupada : You can give me a list of sanyasi's. I will mark who will. T.K.G. : Okay. Srila Prabhupada : You can do. Kirtananada can do, and our Satsvarupa can do. So these three, you can give, begin. T.K.G . : So supposing someone is in America; should they simply write to directly to Kirtananda or Satsvarupa? Srila Prabhupada : Nearby, Jayatirtha can give. Srila Prabhupada : Bhagavan.Bhagavan and he can also do. Harikesa. Srila Prabhupada : And, five six men, you divide who is nearest. T.K.G . : Who is nearest. So persons wouldn't have to write to your Divine Grace. They could write directly to that person? T.K.G . : Actually they are initiating the person on your Divine Grace's behalf. Those persons who are initiated are still your. Srila Prabhupada : Second initiation we shall think over; second initiation. T.K.G . : This is for first initiation, okay. And for second initiation, for the time being they should. Srila Prabhupada : No, they have to wait. Second initiation, that should be given. T.K.G . : Should.Some devotees are writing you now for second initiation, and I'm writing them to wait a while because you're not well. So can I continue to tell them that? Srila Prabhupada : They can do second initiation. T.K.G . : By writing you? Srila Prabhupada : No; these men. T.K.G. : These men, they can also do second initiation. So there's no need for the devotees to write to you for first and second initiation. They can write to the man nearest them. But all these persons are still your disciples. Anybody who gives initiation is doing so on your behalf. T.K.G. : You know that book I'm maintaining of all of your disciples names? Should I continue that? T.K.G . : So if someone gives initiation, like Harikesa Maharaja, he should send the person's name to us here and I'll enter it in the book. Okay. Is there anybody else in India that you want to do this? Srila Prabhupada : India, I am here, we shall see. In India, Jayapataka. Srila Prabhupada : You are also in India. Srila Prabhupada : You can note down these names. T.K.G . Yes, I have them. Srila Prabhupada : Who are they? T.K.G . : Kirtanananda Maharaja, Satsvarupa Maharaja, Jayatirtha Prabhu, Bhagavan Prabhu, Harikesa Maharaja, Jayapataka Maharaja, and Tamal Krishna Maharaja. Srila Prabhupada : That's nice. Now you distribute. T.K.G . : Seven. There's seven names. Srila Prabhupada : For the time being, seven names, sufficient. You can make Ramesvara. Srila Prabhupada : And Hrdayananda. T.K.G . Oh, yeah. South America. Srila Prabhupada : So without waiting for me, wherever you consider it is right.That will depend on discretion. T.K.G . : That's for first and second initiations. T.K.G . : Okay. Shall I send a kirtana party, Srila Prabhupada? The newly initiated devotees are disciples of His Divine Grace A.C. Bhaktivedanta Swami Prabhupad, the above eleven senior devotees acting as his representative. After the Temple President receives a letter from these representatives giving the spiritual name or the thread, he can perform the fire yajna in the temple as was being done before. The name of a newly initiated disciple should be sent by the representative who has accepted him or her to Srila Prabhupada, to be included in His Divine Grace's "Initiated Disciples" book. "Tamal Krishna Maharaja was talking about [with Prabhupada] rtvik gurus to initiate on behalf of Prabhupada after he leaves the planet." On July 9th Yasodanandan wrote, "I heard from Tamal Krishna Maharaja in the afternoon that Srila Prabhupada had told him to send a letter to 'all the temples' to explain the ritvik initiation system for the future." On July 10th Yasodanandan wrote: Tamal Krishna Maharaja comes out of Prabhupada's room. TKG: "Haribol, Yasoda, did you see this?" Yasoda : "No, what is it?" TKG : "This is signed by Prabhupada." Yasoda: "What does all this mean?" TKG: "Devotees have been writing to Prabhupada asking for initiations and now Prabhupada has named eleven ritviks who can initiate on his behalf. Prabhupada said others can be added." These arrangements were for the future of ISKCON after Srila Prabhupada's departure. The next few days after the ritvik appointments I heard more instructions from Srila Prabhupada. Tamal K.G. asked him the next morning, July 8th, if there should be vyasasana's for the ritviks representatives in the temples. Srila Prabhupada immediately said, "No; that would create enmity among my disciples." Tamal K.G. also asked Srila Prabhupada if there could be more ritviks in the future. Srila Prabhupada said that more could be appointed by the GBC at Mayapura. Tamal K.G. asked Srila Prabhupada what to do if a ritvik falls down and Srila Prabhupada replied that the GBC could remove them. These conversations were recorded but the tapes are not available from the archives. The new devotees are junior God-brothers and God-sisters and if we become a pure devotee, diksa guru, those initiates would be 'grand disciples' of Srila Prabhupada. But this must be ordered by Srila Prabhupada and would be done outside of ISKCON. I was devastated! He had the authority to 'fire me' and he did. I went to my room and lamented. Upendra Prabhu came to see me and tried to encourage me. He said he was working on Tamal K.G. to try to get me back. The next day Upendra returned and said Tamal K.G. didn't realize how much service I was actually doing, and they needed me back. I was going to get another chance. It was the one of the happiest days of my life! I relished my service even more after almost losing it. "You are a suitable person and you can give initiation to those that are ready for it. I have selected you among eleven men as 'Rittvik representative of the Acharya, to give initiations, both first and second initiation, on my behalf.' A newsletter is being sent to all temple presidents and GBC in this regard, listing the eleven representatives selected by His Divine Grace. Those who are initiated are the disciples of Srila Prabhupada, and anyone whom you deem fit and initiate in this way, you should send their names to be included in Srila Prabhupada's 'Initiated disciples' book." "A letter has been sent to all temple presidents and GBC which you should be receiving soon, describing the process of Initiation to be followed in the future. Srila Prabhupada has appointed thus far eleven representatives who will initiate new devotees on his behalf. You can wait for the letter to arrive ( The original has been sent to Rameswara Maharaja for duplicating ) and then all of the persons whom you recommended in your previous letters can be initiated ." "You have written to Srila Prabhupada saying you do not know why he has chosen you to be a recipient of his Mercy. His Divine Grace immediately replied, 'It is because you are my sincere servant. You have given up attachment to a beautiful and qualified wife and that is a great benediction. You are a real preacher. Therefore I like you. (Then laughing) Sometimes you become obstinate, but that is true of any intelligent man. Now you have got a very good field. Now organize it and it will be a great credit. No one will disturb you there. MAKE YOUR OWN FIELD AND CONTINUE TO BE RITTVIK AND ACT ON MY BEHALF.'" On July 17th Srila Prabhupada said: "Now I have given my program. You tackle, GBC men. At least, don't make me Alexander the Great in my lifetime. (laughs) They say, "You are great, great, great." But don't make me small while I am living. Tamal KG. : Or after. We will never make you that way. We should never do that. Srila Prabhupada : That's my request. T.K.G. : You've always said to us, at least whatever we have, maintain it. Srila Prabhupada : And people have recognized I am great. Don't make me small. "Krsna's grace is always there, but we spoil Krsna's grace. That is our business. 'But Krsna is giving us so much grace. Let us spoil it.' That is our proposal. If there was no Krsna's grace, how this institution would have come into existence? It was not possible, such a big institution, all by one man's endeavor, starting with forty rupees. Simply Krsna's grace. So don't spoil that. That's not good. Then Krsna will not help. Just like the father gives you money; if you squander that, he'll be very sorry. Tat te. 'Oh Krsna is so kind by giving me this opportunity.' You should take things like that, not that 'For nothing the father has given me so much money. Let me squander it.'" Srila Prabhupada was very concerned that the institution he worked so hard to develope might not be maintained properly after his departure. There are no tapes available from the archives from August 18 1977 to October 1 1977. Srila Prabhupada went to London during this time even though he was too sick to travel. Srila Prabhupada: Hare Krsna. One Bengali gentleman has come from New York? Tamal KG: Yes; Mr Sukamal Roy Chowdury. Srila Prabhupada: So I have deputed some of you to initiate. Hmm? TKG: Yes. Actually.Yes, Srila Prabhupada. Srila Prabhupada: So I think Jayapataka can do that if he likes. I have already deputed. Tell him. Srila Prabhupada: So, deputies, Jayapataka's name was there? Srila Prabhupada: So I depute him to do this at Mayapura, and you may go with him. I stop for the time being. Is that alright? TKG: Stopped doing what, Srila Prabhupada? Srila Prabhupada: This initiation. I have deputed the, my disciples. Is it clear or not? Srila Prabhupada: You have got the list of names? Srila Prabhupada: And if by Krsna's grace I recover from this condition, then I shall begin again, or I may not be pressed in this condition to initiate. It is not good. Giriraja: We will explain to him so that he will understand properly. Giriraja: I said we will explain to the Bengali gentleman just as you have described to us, so that he'll be satisfied with this arrangement. Bhavananda:. "We have to apprise that if your Divine Grace leaves us, what will be the result both to ISKCON society, to each of your disciples individually, and to the entire planet. Srila Prabhupada: That I am thinking, that such a big society, the aims and object may be dismantled. I am thinking from that vision. Bhavananda: Last May, when everyone assembled here in Vrindavan, then that.What was his name? Goswami came? Atula-Krsna Goswami. And after he left, you had apprised us of the fact that there is a movement to, if you should leave, to take the society from us, the properties. And you told us at that time, 'You are all children. None of you has any intelligence.' That was only five months back. We have not grown that much in five months. We're still children. You have always practically directed us in every one of our activities. And where we followed your instructions, there we have been successful. But because we are only children, sometimes we.Whenever we follow your instructions, Srila Prabhupada, we always meet with success. Srila Prabhupada: Yes. (laughs) 'Everyone, all my disciples, they are leaders. As purely as they follow, they become leader. If you want to follow, you can become a leader. You are Indian. But you don't want.' I told them that. Tamal KG: Yes, they probably wanted to propose somebody who would take over our movement. Srila Prabhupada: Yes. Leaders; all nonsense. Leader means one who has become first class disciple. He is leader. Evam parampara-prapta.One who is perfectly following.Our instruction is ara na kariha mane asa.You know this? What is that? Guru-mukha-padma-vakya, cittete kariya aikya, ara na kariha mane asa. Who is leader? A leader, to become leader, is not very difficult, provided one is prepared to follow the instructions of a bonafide guru. Tamal KG: "All of your plans are perfect, Srila Prabhupada. And our perfection is simply to carry them out without changing in any way. You have such complete plans that we don't have to do anything new. We have to work our whole lifetime simply to carry out what you've planned." Tamal KG: Seems like your activities, Srila Prabhupada, are so much pleasing to the previous acharyas. Jayapataka : This is the secret you are showing, working towards satisfying the desires of the previous acharyas. Srila Prabhupada : Tandera carana-sebi-bhakta-sane bas. So you are all bhaktas. To live with you, to serve the lotus feet of the acharyas, that's good. Svarupa Damodara: We are already becoming famous as spiritual United Nations. Jayapataka: You've given the secret for success. Srila Prabhupada: If possible, make some improvement in Bhaktivinoda Thakura's birthplace. Jayapataka: In Malda district at Ramakeli, where Lord Chaitanya first met with Rupa and Sanatana, there is a temple of Radha-Krsna that.Rupa and Sanatana Goswami used to worship those Deities. Bhaktisiddhanta Thakura Prabhupada has put a lotus feet of Mahaprabhu there. TKG: It is your great mercy, Srila Prabhupada, that you are allowing us to do a little helping to you in your service to the previous acharyas. We are completely fallen, without any spiritual credit, but still, you are allowing us to help you in a little way. Jayapataka: Without your intervention we would have no hope. After Srila Prabhupada actually left the planet the first Vyasasanas started to appear in the temples. I was shocked because this was against Srila Prabhupada's direct instructions. I returned to Vrindavan in early 1978 and met Tamal K.G. in his room. I asked him why Vyasasana's were being put in the temple rooms when we both heard Srila Prabhupada say not to do such a thing. He asked me if I thought Srila Prabhupada could of said anything else after I had left. (I had to leave at the end of July 77 because my visa had expired.) I said I'm sure he could have but I don't know why he would have when he'd talked about the ritvik system for months before his departure. Tamal K.G. said, "Well he did, and if you don't believe me you can ask Kirtanananda Swami." "Actually, Prabhupada never appointed any gurus. He appointed eleven ritviks. He never appointed them gurus. Myself and the other GBC have done the greatest disservice to this movement the last three years because we interpreted the appointment of ritviks as the appointment of gurus.". "You can't show me anything on tape or in writing where Prabhupada says, 'I appoint these 11 as gurus.' It doesn't exist because he never appointed any gurus. This is a myth." "Spiritual Master Lives in His Teachings"
Srila Prabhupada: When you read Bible, you follow spiritual master. How can you say without? As soon as you read Bible, that means you are following the instruction of Lord Jesus Christ, that means you are following spiritual master. So where is the opportunity of being without spiritual master? Srila Prabhupada: Spiritual master is not the question of... Spiritual master is eternal. Spiritual master is eternal. So your question is without spiritual master. Without spiritual master you cannot be, at any stage of your life. You may accept this spiritual master or that spiritual master. That is a different thing. But you have to accept. As you say that "by reading Bible," when you read Bible that means you are following the spiritual master represented by some priest or some clergyman in the line of Lord Jesus Christ. So any case, you have to follow a spiritual master. There cannot be the question without spiritual master. Is that clear? Madhudvisa: I mean like we couldn't understand the teachings of the Bhagavad-gita without your help, without your presentation. Srila Prabhupada: Similarly you have to understand Bible with the help of the priest in the church. Srila Prabhupada always talked about the importance of following the words of the spiritual master. He spoke these words in Seattle in 1968. I lived there but I was only 14 and didn't get the chance to see him then. Later in Vrindavan, in 1977, when I got the good fortune to serve him personally, he said the same thing. He said that when he left the planet we would follow his books and initiate devotees on his behalf. The Christians follow Christ by reading the bible with the help of a priest etc. In the same way the devotees follow Srila Prabhupada by reading his books with help from the senior devotees. Christ and Srila Prabhupada are both sent by Krishna, sakta-vesa avatars. They can deliver us and we should help their missions by representing them purely. Srila Prabhupada asked us to act as ritvik acharyas, or representatives of the acharya. That way the whole Hare Krishna movement will be united under our common father and we will become a dynamic preaching force again and the glories of the Lord will flood the world with the ocean of love of God. Thanks to Srila Prabhupada! Srila Prabhupada's Godbrother Srila Sridhara Maharaja also ordered the Ritvik initiation system before he left the planet. He saw how appointing 'regular gurus' failed in the Gaudiya Math and in ISKCON and thus he did exactly what Srila Prabhupada did; he made adjustments according to the circumstances. Here are the exact quotes from His Holiness Sridhara Maharaja: "With this I transfer these beads; from now he [Govinda Maharaja] will do so on my behalf as ritvik. The ritvik system is already involved both here and in the foreign land. The ritvik is the representative, so if you want to take [initiation] from me and you take from his hand then it will be as well and as good as taking from me. In the maha mandal [earth] Sargar Maharaja [formerly Akshayananda Swami] and many others, they are also ritviks of Swami Maharaja [Srila Prabhupada] and also myself and they may do so. But in this Math he, Govinda Maharaja will be the representative. Henceforth he will represent me in this affair beginning from today's function. The last thing Srila Prabhupada said before he left his body on November 14th 1977 was to give prasadam to all of the devotees. Then he chanted Hare Krsna and went back to Godhead. This shows the enormous compassion of Srila Prabhupada. Even though he was leaving his body, he was always thinking of Krsna and the welfare of his devotees. All glories to His Divine Grace, our fearless general, our ever well-wisher. Srila Prabhupada wanted the ritvik initiation system to continue for the duration of ISKCON. This is what I personally heard him say many times while I served him in Vrindavan. This is all he talked about for the last six months before he went back to Godhead. This is what Srila Prabhupada ordered in the July 9th Newsletter to all temples and GBC's. I hope that the GBC will consider this evidence with an open mind and heart and then do the needful. After all, it's better late than never. Srila Prabhupada wants us all to be siksa gurus within ISKCON and if we want to be diksa gurus we should do so when we are qualified and have been ordered by His Divine Grace, but only in our own temples. This is the Vaisnava etiquette that Srila Prabhupada followed. Let us follow his example and preach cooperatively, on his behalf. My plea is to the GBC, to meet and study the final days of Srila Prabhupada in this regard. Now the movement is splintered with each of the 100+ guru's having a little group of his own. Vaisnava etiquette is lacking in most cases. 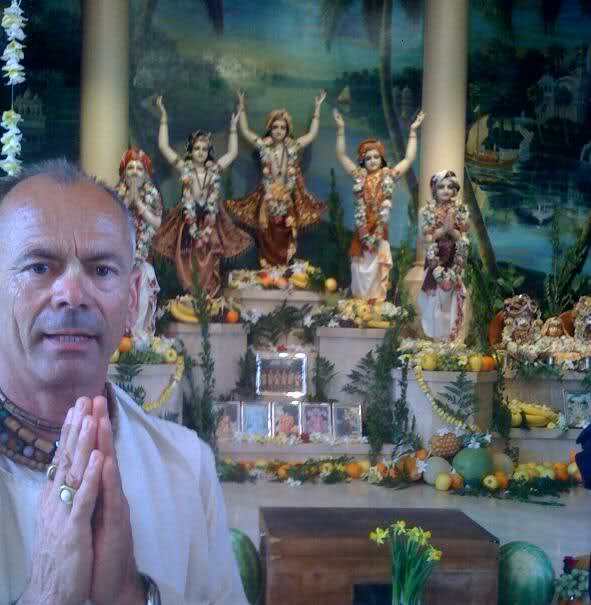 Devotees that would of joined ISKCON are holding off or joining other groups. Intelligent people are rarely coming as before. The ritvik initiation system will bring more souls to the shelter of Srila Prabhupada and his Hare Krishna Movement. The ritvik initiation system will reunite Srila Prabhupada's family and make his temples a place where the whole world can live again! Srila Prabhupada said we will show our love for him by how we cooperate after his departure. What can a bunch of splinter groups accomplish? If we do learn the art of cooperation and the ritvik initiation system gets re-enacted it will be the greatest day in the history of ISKCON after Srila Prabhupada's departure. The preaching mission will expand just like it did in 'the good old days' with Srila Prabhupada in the center. Sometimes it takes years and sometimes lifetimes to fulfill the order of the spiritual master. But better late than never! In that the evidence shows that Srila Prabhupada, the Founder / Acharya of ISKCON ordered a ritvik initiation system to continue henceforward for ISKCON from the date of July 9th 1977, and a Newsletter was sent to all GBC's and Temple Presidents signed by Srila Prabhupada stating this order, the GBC body should act immediately to implement the ritvik initiation system. All previous GBC resolutions condemning the Ritvik initiation system should be retracted and an apology from the GBC members should be sent out to any and all devotees who may have been affected and/or offended by these resolutions.